Online Booklet - "Introducing the Church of Christ"
As one looks about in the religious world, there are hundreds of names that supposedly represent the church for which Christ died. But a quick glance into the word of God clearly shows most of these names are unbiblical and unfounded. Since these names cannot be found within the context of our religious standard - the Bible, it is unwise and disrespectful to adopt them as followers of Christ. WHY ARE MAN-MADE NAMES WRONG? Simply, they are condemned in the New Testament. Paul, in his letter to the Corinthian church, wrote these words, ". . . that ye all speak the same thing, and that there be no divisions among you; but that ye be perfected together in the same mind and in the same judgment" (1 Corinthians 1:10). In the next few verses, Paul further discusses what he meant. "Now this I mean, that each one of you saith, I am of Paul; and I of Apollos; and I of Cephas; and I of Christ. Is Christ divided? Was Paul crucified for you? Or were ye baptized in the name of Paul?" (1 Cor. 1:12-13). To give honor to a person such as "Luther" over the name of Christ is to divide honor belonging only to Christ. To exalt an ordinance such as "baptism" is to lift it higher than the name which is above every name - Christ. To designate a manner of church government as "Episcopal" or Presbyterian" is to add what God never intended. Paul warned the early church against man-made titles; we of the churches of Christ today accept his plea. There is something in a name. We must live by it and uphold it. Notice that these references are not denominational names. 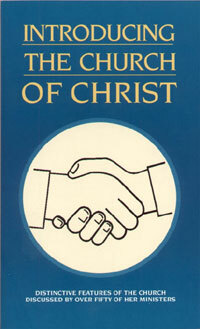 They do not refer to different churches, only to God's one true church. In each name we can see God and His Son's name being glorified. God has chosen these names for His Church. DOES NAME MAKE SCRIPTURAL CHURCH? This question is a reasonable one because today there are many churches that wear the name, church of Christ. However, when we check further, we will find many practices not found in our New Testament pattern. The name is only a step in the right direction. Just being called the church of Christ, church of God, or church of the firstborn does not make it such. If the organization is not according to the scriptures, in work, worship and purpose then it is not Christ's church. Many churches have the right name but have corrupted the scriptural plan of worship by adding things God did not authorize. Any activity which cannot prove its right to be by the Scriptures, stands condemned (1 Thessalonians 5:21). Christ is the builder. He is the head over all things to the church, which is his body. (See Eph. 5:23-24; Col. 1:18). The churches of Christ carry Christ's name on their buildings to show whom we represent. Yet, on a daily basis when we live and work in our various communities, we are not known as or called "church of Christ," but simply Christians. God refers to his people as Christians, saints, children, disciples, priests, and brethren. The name marks us as being owned by Christ (Acts 11:26). Every Christian is a saint because his sins are forgiven (Rom. 1:7). He is a child of God because he has been born again (1 Pet.1:22-23); a disciple because he is a learner of Christ (John 15:8). He is a priest because he is empowered to worship and serve God directly through Christ (1 Pet. 2:5). Christians are all brethren, because they are all children of the same heavenly father (Gal. 6:1). Those who love and respect God's will appreciate the names given by him. We must use these names rather than names that indicate division and that disrespect God's authority. If you refer to your denomination to express your faith or religious conviction, there is too much in your name. Why not be a Christian only? One may ask, what's in a name? There are many who feel that there is nothing in a name. I disagree, based on Acts 4:12. There is a name that is above all others, and that name is Christ. No other name has the power or authority of Christ's. If God saw fit to use this name, who are we to change it? The story is told of a man arrested for making whiskey or home-brew. He came before the judge, who was a church going man. He decided to have some fun with the accused. The judge asked him, "What is your name?" The man replied, "My name is Joshua." "Are you the Joshua who made the sun stand still? ", the judge asked. "No sir," the man replied. "I am the Joshua that made the moonshine." The story is simple. There is something in a name. In order to please God, we must do all in word and in deed. We know that this is true when it comes to everyday things like the naming of our children. Have you ever heard of a mother naming her daughter, Jezebel; or her son, Judas? No parent would permanently scar a child with a name that is noted for doing wicked or evil. There is something in a name. God has given Jesus as our means of salvation. His name is the only one by which man can be saved (Acts 4:11-12). To this name, "every knee must bow" (Philippians 2:9,11). The common saying that one name is as good as another may be true in non-religious matters, but biblically, no name is as good as Christ's (Eph. 1:20-21). The church is the bride of Christ. A bride should wear the groom's name (2 Cor. 11:2). We who have been obedient to the will of Christ, are in the family of God. Should not the family wear his name? (1 Tim. 3:15; Eph. 3:14-15). Marshall Keeble, a well known black evangelist, commenting on the importance of a name, related this illustration that a check is no good without a name. He told of a preacher who was conducting a meeting in a certain city. There was one lady who attended every night and heard him assert that there was nothing in a name. He said that they were to work out their salvation, and the name had nothing to do with it. He made this point over and over. One night this lady told him that she would like to make a contribution to his ministry. The next day he went by her house to pick up the money. She gave him a check and he went directly to the bank to cash it. The cashier returned the check to him saying that there was no name signed to it. "She must have forgotten to sign it," the preacher said, so he returned to the lady's house to get her to sign the check. To his surprise, she informed him that she had not forgotten to sign it but was only doing as he had preached and did not put her name on the check. The lady made her point, and taught him never to preach that again. From the Scriptures and practical illustrations, we can see why the church must wear a Bible name. Our feelings may guide us contrary to God's word. But religiously, we are not governed by our feelings. What we believe must be based on facts (Rom. 10:17). Just any way or name is not God's way (Prov. 14:12). Let us do things that are according to God's plan. Only in his word can we find the right path (Psalm 119). The church of our Lord should not wear names like Lutheran, Baptist, Methodist, Mormon, Catholic, Jehovah's Witnesses, etc., unless they can be found in his Book. We must practice the things Christ and the apostles left for us to do. Christ desires that we unite (John 17:20-23), but we cannot unite with error. We must come together under Christ's name. It is an honor to wear his name. We must please him if we expect him to receive us when he comes back for his church (John 14:2-3). Discuss the lessons of 1 Corinthians 1:10-13 and the use of denominational religious names. What name does God give to his church? If a church wears a proper Bible name, does that mean God is totally pleased with them? Is there any significance in the religious name we choose to wear? In which name is salvation offered? (Acts 4:11-12). *This booklet may be purchased from Star Bible Publications. You may call them at 1-800-433-7507 or visit their website at: Star Bibles for more information. It is also available in Spanish.